Just a week after Dr. Craig Spencer was declared 'Ebola-free', The Daily Mail reports a woman, who had arrived from Guinea 18 days ago (and was on the NYC Ebola monitoring list), dropped dead in a Brooklyn hair salon this afternoon. FDNY sent their Special Operations and Hazmat units but she was declared dead at the scene. Witnesses said she was bleeding from the "face, nose, mouth, everything." 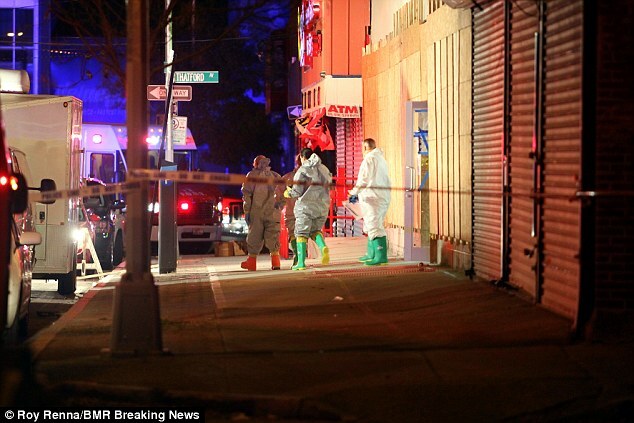 There are new fears of a possible Ebola outbreak in New York City after a woman dropped dead on Tuesday afternoon. FDNY activated the Special Operations and Hazmat units after the the woman, who had recently traveled from Guinea according to a source on the scene, died at Amy Professional African Hair Braiding in Brooklyn. At the same time, individuals could be seen walking in and out of Amy Professional African Hair Braidig wearing no protection at all. According to a source who was on the scene, the incident occurred just after 3:00 in the afternoon, and the woman was pronounced dead on arrival. The remains of a woman who died of an apparent heart attack at a hair salon in Brooklyn will be tested for Ebola. EMS responded to the hair salon on Belmont Avenue in Brownsville around 2:30 p.m. on Tuesday. The woman had been on the list of those being monitored for Ebola exposure. She had recently arrived in the city from Guinea and was one of 350 people on the monitor list. The New York City Health Department said at last check the woman did not have symptoms and was being monitored because of her travel history. She had been back in the country for 18 days. Test results are expected back late Tuesday or early Wednesday.